When Pittsburghers gathered for the city’s annual LGBTQ+ Pride parade Sunday, they probably expected the marchers to toss candy and wave rainbow flags — but they got their fair share of political chants slung their way as well. The circumstance of two parades came as the result of fundamental disagreements within Pittsburgh’s LGBTQ+ community itself about comfortability with corporatization. The Delta Foundation, an organization dedicated to advocating for LGBTQ+ rights, and the parade’s organizers, announced in January that naming rights for the annual parade would be given to the EQT Corporation. Some activists decided to organize a “People’s Pride” to follow immediately behind in the path of the EQT-sponsored parade, criticising the corporate influence on the parade, EQT’s fracking and their history of donating to politicians who have supported anti-LGBTQ+ legislation. While stirring up some controversy this year because of its corporate sponsorship, the original parade remained the largest and most visible event for the LGBTQ+ community in the city during the weekend’s Pride celebrations. Point Park sophomore Emerson Andrews emphasized the importance of community in choosing to attend the larger parade. The Delta Foundation-organized event comprised more than just a parade. Portions of Downtown were closed off from traffic both Saturday and Sunday for a variety of Pride-related activities, including carnival style booths up and down Liberty Avenue and a performance Saturday night by musician Jennifer Hudson. Announcers during the EQT march itself suggested that this year’s Pride parade was one of the best attended in the event’s history in Pittsburgh. But while many chose the Delta Foundation’s parade because of its popularity and vibrancy, some sympathized strongly with the message that the People’s Pride parade was sending. Interspersed between floats featuring drag queens and huge rainbow flags, the event’s business backers joined in the parade as well, some in vehicles or floats and some with contingents of their employees marching on the street. Local businesses and organizations — like UPMC and Uber — had large groups of marchers. Chipotle handed out coupons from their float — a rented red tour bus topped off with dancers on the upper level. Ten thousand Caftans — a group of marchers wearing long, brightly colored tunics — closed out the EQT march, passing through Downtown about 30 minutes before the People’s March traveled on the same roads. Rather than dancing, many in the second march were chanting. 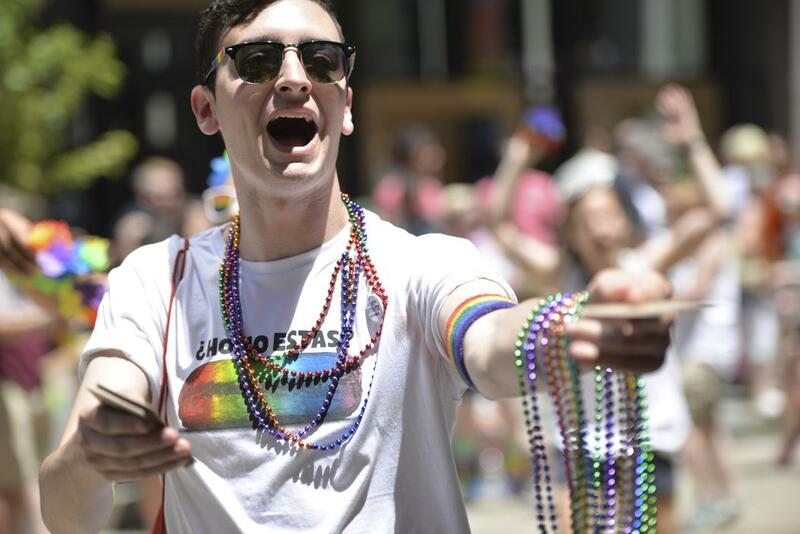 Pitt senior Brian Murray attended the EQT parade Sunday but mentioned concerns about corporatization of LGBTQ+ events and movements and questioned the sincerity of corporate support. People’s Pride organizers sought and received police permission for their parade and stressed that it wasn’t intended as a “confrontation” with other marchers. But many, including Mayor Bill Peduto and County Executive Rich Fitzgerald, attended the EQT Equality March and not the other. The group explicitly criticized the Delta Foundation in a Facebook post announcing the decision to organize an alternate parade. “We​ ​recognize​ ​the​ ​history​ ​of​ ​Pride​ ​as​ ​an​ ​act​ ​of​ ​resistance​ ​and​ therefore​ ​we​ ​will​ ​march​ ​to​ ​bring attention​ ​to​ ​and​ ​hold​ ​Delta​ ​accountable​ ​for​ ​its​ ​historical​ ​exploitation​ ​and​ ​negligence​ ​towards​ ​our black​ ​and​ ​brown​ ​and​ ​trans​ ​people,” the group said. The People’s Pride rally, which had been planned and received a permit to walk an hour after the EQT Equality March started along the same route, confronted Pittsburgh City police dressed in riot gear on their way into downtown. A tense exchange ensued, during which marchers chanted, “We have a right to be on the sidewalk,” and, “We have a permit,” referencing the fact that the march was officially police-sanctioned. After a standoff of a few minutes, city police retired, allowing marchers to continue along their planned route and finish in Market Square around 2:30 p.m.
As the marchers proceeded down Grant Street, politically charged chants rang out from the crowd. “Black trans lives matter,” and, “Our pride is not for sale,” chants rose up from the marchers — who were much less vibrantly dressed than the EQT crowd. Despite the differences in the marches, there appeared to be widespread acceptance among those involved that the Pride weekend shouldn’t be divisive within Pittsburgh’s LGBTQ+ community. “This march is about love, liberation, pride and spotlighting our marginalized communities,” SisTers PGH — the organization responsible for organizing the People’s Pride march — said in a press release following the confrontation with police. Murray also stressed the importance of Pride events, regardless of sponsorship, to LGBTQ+ Pittsburghers as a vital connection to the community.